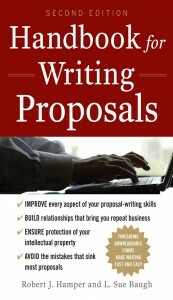 Comment and WIN One out of Five Best Proposal Books Every Week! That’s right! Quote Roller is giving away one great book every week for the best comment left on our blog! By leaving a comment during next 5 weeks you will enter the giveaway automatically and if you are a lucky one, you will receive one of the five following books. But that’s not all! Existing Quote Roller users get one month of service for free (psst, you can sign up before you win). Every Wednesday we will decide who has posted the best comment and announce the winner on our Facebook page and Twitter. Make sure you are following us, so you won’t miss your great present! 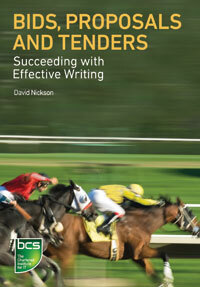 This book is a must-have guide for anyone producing bids and proposals ranging from short covering letters through to tenders for major corporate or government procurement. Numerous mini case studies and quotes from specialists are included. Sales, marketing, project and technical staff will all benefit from reading the book and keeping a copy on their shelves for reference. It is also useful for business students at all levels. Contents include: the art of proposal writing; the proposal lifecycle; presentation and format; editing and reviewing; getting information from experts; corporate and client culture; writing proposals within the OJEC/OJEU procurement system. While it is becoming increasingly common for contracts to be awarded through formal procurement processes, smaller businesses could be missing out. But with the right skills and confidence, there’s no reason not to take advantage of this potentially lucrative route to market. 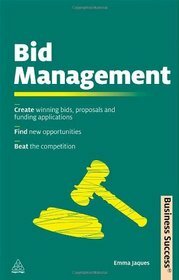 With an insightful interview with the Director behind the London 2012 Olympic bid, Bid Management uncovers the myths of bidding and teaches you all the skills you need to win new clients and retain existing ones through formal tender processes. Proven techniques and invaluable advice for writing winning business proposals — revised and updated! What makes a winning business proposal? It highlights your skills and services, meets your client’s needs, and clearly sets you apart from the competition. Whether you own your own business, need to train your corporate staff, or simply want to improve your skills, Handbook for Writing Proposals, second edition will show you how to profit from every proposal you write. Finally, a book about proposal development that won’t put you to sleep! A must read for anyone in the business of selling or marketing professional services. If you are looking for real insights into the proposal business, if you want to work smarter and not harder, and if you care deeply about the outcome of the proposals you produce, this is the book for you. Proposal Development Secrets is full of ground-level advice from the proposal trenches and valuable insights that might just make proposal development a little less taxing and a lot more rewarding. It focuses on the cold hard realities of the proposal business and provides you with some strategies to help you get home to the people and things that you love. 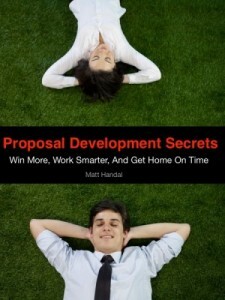 In Proposal Development Secrets, Matt Handal, author of Marketing To The Mind, shares his unique insights with you. It used to be that you could ignore RFPs. Only a small portion of the market used them in their buying process and you could work around those companies. Today, governance rules dictated by boards and administered by finance have made RFPs and RFQs a dominating component of the large-deal world. Not only can you no longer ignore them, but you need to know that companies use RFPs-and increasingly purchasing and procurement-for many reasons that have little to do with the opportunity offered in the official document. The result? We all have no choice but to go through the expensive and time-consuming process. And though you might like to believe the system is fair, if your company is pitching a disproportionately larger client, you’re at a disadvantage from the moment you begin the process. WHY? Because the RFP system is not built for you. It’s built for big companies and government institutions that benefit from RFPs. But no matter how hard you try to avoid them, there will inevitably come a day when that irresistible RFP lands on your desk. It’s almost like it was written for you. 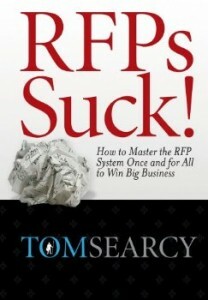 This book is your best guide on what to know, to question and to do when faced with that RFP. It will also help you develop the confidence and understanding to know when to quit the process before it even starts or when to stay in it and win big.